Wall Street loves to spout nice little catch phrases when suddenly what they thought (or told) investors should happen suddenly turns around and does something else. Some classics? The “value trap.” This basically is said when something was a “sure thing” as to go to the moon, and all you had to do is get on the launching pad now as to be along for the ride. Then? Squat happens. Not only does it not go up, it just sits there. However, the whole time it is burning fuel. (i.e., burning through your balance in some form of fee to sit there.) But not too worry, you’re stuck in “value.” Makes one feel all sort of fuzzy when it’s put that way is it not? What it really means, is that they are missing out on grabbing a fee. And that can not be tolerated. After all, it’s their sole purpose to gain a fee (ahem) I mean: Its their job to make sure “you’re not leaving money on the table.” Yes, that’s it. Well, I may not be as sophisticated as those on Wall Street, but I will make this observation. It just may be “different this time.” Only not for those that have been trying to weed through all this smoke and mirrors. Rather, for all those architects that put these houses of cards together in the first place. Suddenly this other “trap” analogy is showing its hand and it has a great many that pontificate that stocks are “fairly valued” and other such drivel very nervous; for its implications can have a great effect on their own investing future. For how does one explain a “trap door event” to a client, when they’ve been assured their investment thesis was on solid ground? 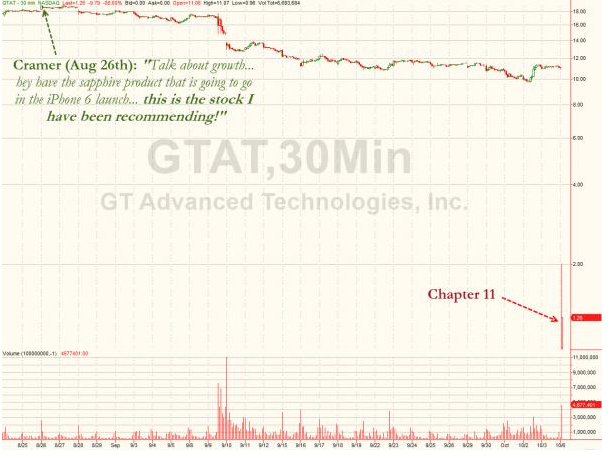 Nothing puts this into the correct framing and shines a spotlight brighter for all to see than the latest absolute debacle for stock recommendations from non other than the once touted “genius” of mom and pop investors (or should I use his own “home gamers” moniker) Jim Cramer of CNBC™ fame. In my opinion, this talking head has done more damage to the individual investor who follows his dissertations or recommendations than almost any other single person. Why? Easy – For the few that are actually left in these markets with their 401K’s still struggling or trying to understand the ups and downs. Then basically being reassured by nearly every so-called “smart crowd” talking head that the absence of downs is a product of “the new normal.” And those that say it’s not should be shunned. To suddenly watch their investment go up – down – then out – changes the way you view a thing. Dramatically! Here’s just the latest example. Here’s a chart of what I believe will become a reoccurring theme to many more so-called “Wall Street darlings.” Welcome to the “New” New Normal earnings season. At issue here is not that it’s just Jim Cramer, he was far from the only one. However, he is basically the single most recognizable figure with his main stream investing books, bells, buzzers and whistles TV show, along with putting on “investing shows” across the country on college campuses. Along with probably single handily instilling more false confidence in many nervous moms and pops by touting the line “The Fed’s got your back!” more than any other single individual I can fathom to name. Not what other analysts want to hear being used either. For it was reported consensus estimate was around $5.2 Billion in profit. That’s quite a bit however when it comes in at $3.8 – that’s a whole lot of “value” no longer there. The whole social media space I believe will be one of these areas hardest hit in the whole “new” new normal earnings period, based solely on the facts that “free money” will no longer be available to throw at this space as it goes away – at the very time it’s probably needed more than ever to keep it propped up. With the Federal Reserve’s QE policy set to end this month all these “new economy” juggernauts are going to have to prove that giving away the store for “free” as to entice users, customers, and more; will have to prove they have the ability along with the quantifiable hard numbers accompanied by real “cold cash” they can pay those promised returns to Wall Street. Just watch how fast the “players” in the world of algos and High Frequency Trading can change the meaning of “liquidity trap” when they decide – it’s not in their best interest to play. It will take on a whole different connotation than anyone on Wall Street has been telling you.